I’m checking off a long list of works in progress! There are two baby quilts with a swiftly approaching due date: one quilt is finished, one is in the final steps of binding. Did you notice that I mentioned *one* due date, but two babies? That’s right, twins! You’ll hear lots more about that when the quilts are done and I’m cleared to share. I can’t wait to tell you all about it! These quilts were designed to have special meaning for their families. My hope is that the quilts will help the babies see and learn about precious stories from their past and give peeks of the adventures ahead — which is a lot to ask from tummy time, isn’t it? But with a couple interactive quilts and a loving Mommy and Daddy, I have faith. There’s also a quilt top that I sent off to a local shop for long arm quilting. With the time crunch, I just couldn’t do it all. It was a relief to admit that and accept (paid) help. Hopefully I’ll have that one back soon so I can work on binding it over the upcoming holiday weekend. 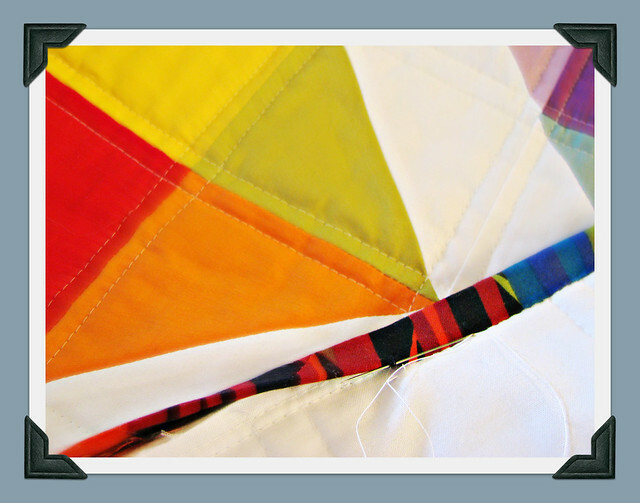 I’ll share more about the importance of this special quilt soon, too. I’m excited about our upcoming quilt-worthy celebrations and hope you have many of your own in the months ahead!